The regional divisions of the Central and South American super-region. The Central and South American regions are the combined region of Central America super-region and South America super-region. Besides the unique native mechanics here (which are also present in North America super-region) these parts also contain unique religious mechanics for Inti, Mayan and Nahuatl. Nations with these religions need to fully reform their religion before being able to embrace institutions at which point they will be able to keep all the benefits gained from the reforms in addition to getting a technology boost. The area (like its North American counterpart) sports a large number of uncolonized provinces. While there are several OPM migratory tribes along the eastern coast most of the nations here are located in two main clusters in the northwest and the west, making it a bit harder for outside forces to reach and wage war against them (thus allowing them to survive longer into the game). Due to the big technology gap between the native nations here and outside forces the majority of them get conquered early on in the game, unless a single power managed to unify enough of the minor nations under one banner before trying to oppose the invading forces. The provinces in this area belong to colonial regions which if colonized by an outside nation (not from the continent) will form a colonial nation once enough of them have been settled in a single colonial region. The new nation will be a subject of its mother nation until it will declare and win an independence war. Tribal governments are the dominant government form in these parts. Native Council scattered in the northern, eastern and southern parts. Despotic Monarchy in the northwestern and western parts (along with a single Theocracy). Mayan and Nahuatl in the northwestern part. Inti in the western part. Animist scattered in the rest of the area. Mesoamerican in the northern part. Andean in the western part. South American in the rest of the area. Central American, Otomanguean and Mayan in the northwestern part. Caribbean and Chibchan in the northern part. Andean and Marañón in the western part. Je and Tupi in the eastern part. This section may contain outdated information that is inaccurate for the current version of the game. The last version it was verified as up to date for was 1.19. For countries with the Native Council government type. 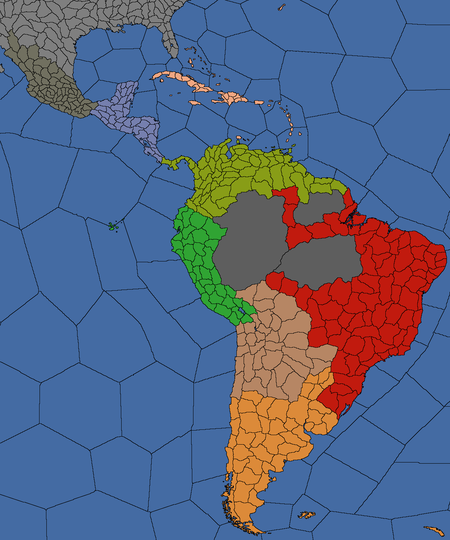 Notes: This region holds provinces necessary for forming Maya and UPCA. The province of Sotuta (846) is of religious importance for Mayan nations. Notes: This region holds provinces necessary for forming Venezuela. Notes: This region holds provinces necessary for forming Chile and Paraguay. Notes: The province of Cholula (2644) is of religious importance for Nahuatl nations. Notes: This region holds provinces necessary for forming Inca. The province of Lima (809) is of religious importance for Inti nations. Notes: This region holds provinces necessary for forming Chile. This page was last edited on 19 January 2019, at 16:50.